and plant products to that country. The information contained in this circular is believed to be correct and complete up to the time of preparation, but it is not intended to be used independently of, nor as a substitute for, the original texts, and it is not to be interpreted as legally authoritative. Ordinanoe of September' 27, 1926, (Gazette No. 427) defines 14ving plant materials and authorizes promulgation of regulations, governing their importation.. 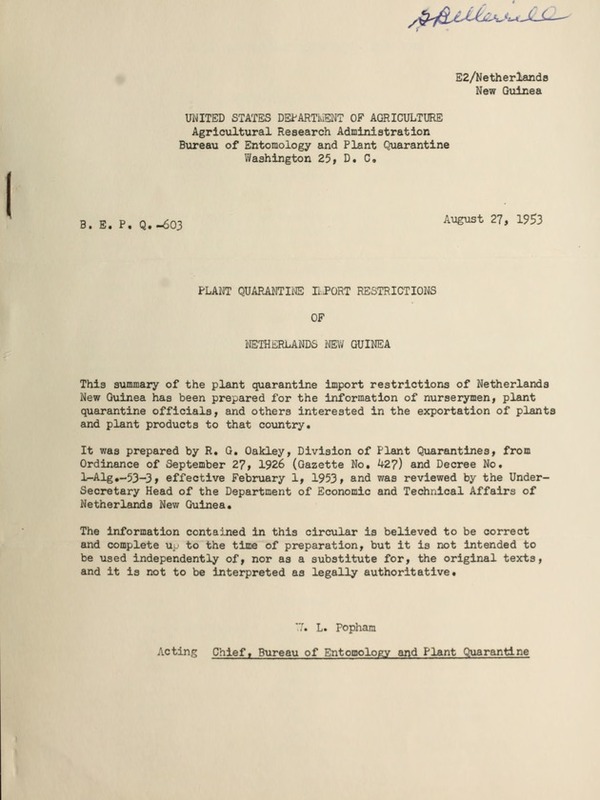 The regulations6n cover living plants and parts thereof-(including mail ahipbients)* except 'as exempted in Paragraph 1 below,' and require that importations be accompanied by a health certificate of the country oforigin. Speial, additional certifications are required for plants and parts of 'banana, citrus, coconut, potatoes, etc. Cichorium Past inaca Sixum sisarum. (c) Vegetablesp bulbous and.tuberous plants (with the exception of potatoes)p root's and rhiz6mes., provided that same are intended for'bonsumption or for medicinal 'ends. (d) Nursery-ptock of scallion and garlic. known to cur in the country of origin,. must state that "Witches broom disease (.arasmium perniciosus)"
and "awollen shoot-disease" are not known to occur in the cogntry-of origin. state such plant material-was fumigated previous to being shipped. where. the said- diseases occur. certifiate musnt. state that in the country qf origin neither pineapple wilt nor pineapple weevil is known to occur. yellow dwarf virus diseases are known to occur. up in the Netherlands, may be accompanied by a certificate of inspection issued by one of the officials of the Phytosanitary Service in Wageningen, instead of the certificate of the country of origin. Consulate-General of the Netherlands in Singapore. NOTE: The remaining articles of this decree concern disposal of plant material upon arrival in New Guinea and contain instructions to officials. of Dew Guinea relative to inspection# treatment, return- to country of origin, or confiscation of plant material when deemed necessary.